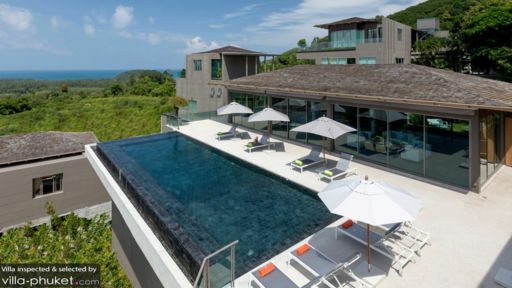 Tropical Castle is a contemporary ocean-front luxury haven perched in the green hills of Phuket, overlooking breathtaking Andaman sea. The estate is built on 5000m2 of tropical land. The Tropical Palace was designed by the renowned French designer Carole Bensimon and it features striking modern architecture, ruled by glassed walls and doors to maximize the breathtaking view over the landscape and the ocean blending in with the clear blue sky. All of the villa suites overlook the ocean and there are lots of communal hang-out areas, indoors and out on the breezy verandas from where you can easily jump into the breathtaking infinity pools that light up beautifully in the evening, creating a truly magical ambiance. The tropical Palace awaits just a ten minutes from Layan beach and it is also just a short drive from the airport. All the spacious villa suites are spacious and luxurious, featuring air-conditioning, ceiling fans, high quality beds and terraces with ocean view. The rooms also have dressing-rooms a private en-suites with full bathroom amenities. The villas at Palacio I boasts TVs with DVD-players for watching movies before sleep late in the evening. The estate features two large tropical gardens of which one is designed especially for the kids while the other one is perfect for day-time lounging and sipping from tropical cocktails while gazing at the breathtaking views all around you. 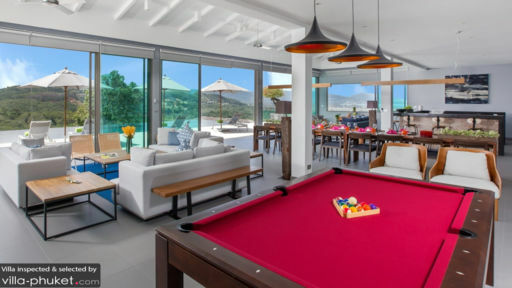 Palacio I and Palacio II each boast a 22 metre long salt-water infinity pool with pool toys. There is also a bar lounge for sunset drinks and garden BBQ's can be arranged for you by the excellent chefs of Tropical Castle. Tropical Castle is a contemporary ocean-front luxury haven perched in the green hills of Phuket, overlooking breathtaking Andaman sea. The estate is built on 5000m2 of tropical land. Tropical Castle was designed by the renowned French designer Carole Bensimon and it features striking modern architecture, ruled by glassed walls and doors to maximize the breathtaking view over the landscape and the ocean blending in with the clear blue sky. All of the villa suites overlook the ocean and there are lots of communal hang-out areas, indoors and out on the breezy verandas from where you can easily jump into the breathtaking infinity pools that light up beautifully in the evening, creating a truly magical ambiance. Tropical Castle awaits just a ten minutes from Layan beach and it is also just a short drive from the airport. Highly trained professional and friendly staff looks after your during your stay at Tropical Castle with 5 star services, making your stay most memorable and pleasurable. There are 2 Gourmet chefs, 6 housekeeping, 2 drivers and 1 villa manager. 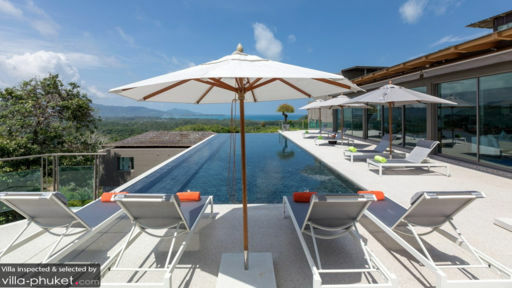 The villa is located on one of Thailand’s most popular islands, Phuket. Thailand is famous for its gorgeous white sand beaches and its azure blue ocean. The villa is just a short drive away from many of these beautiful beaches including the popular Layan beach. The international airport is just a 15 minute drive away. Tropical Castle is indeed a ridiculously huge villa. My family of 32 occupied all 18 rooms and we still have plenty of space. I say this villa is good for even up to 50 pax. It is located slightly far from the main beach area, but it is nicely tucked away on a hilltop overlooking the beautiful sea. Security guards and service staff are friendly and helpful and easily met our needs during our stay there in June. The rooms are all beautiful and well equipped, except for two or three rooms, where we experienced power outage. The villa is generally well maintained. The gym, however could not be used and some repair works need to be done. We love our stay at tropical castle and I thank the team at the villa for providing us a memorable holiday!